Words & Food | My two favorite things. All on one site. My two favorite things. All on one site. Michael Moss, with the New York Times Magazine, recently wrote an utterly compelling article called “The Extraordinary Science of Addictive Junk Food.” An excerpt from his new book, Moss’s article explains the success of processed food giants in tapping into our brain’s most basic desires. Essentially, he explains, the portion of our brains still attuned to the necessities of survival constantly crave fat, salt, and sugar. However, more is not necessarily better. There is a sort of sweet spot or “bliss point” that triggers just the right amount of pleasure in the brain without overwhelming it with one of those three essentials. One of the examples Moss uses is soda and, more specifically, Dr. Pepper. I think that soda/colas are an interesting test case, as they are about as far away from a naturally occurring food as it gets. Perhaps because it is so clearly artificial already, food scientists and marketers seem willing to screw with it even more. Of course my ears perk up when I hear about people adding wheat to weird things. 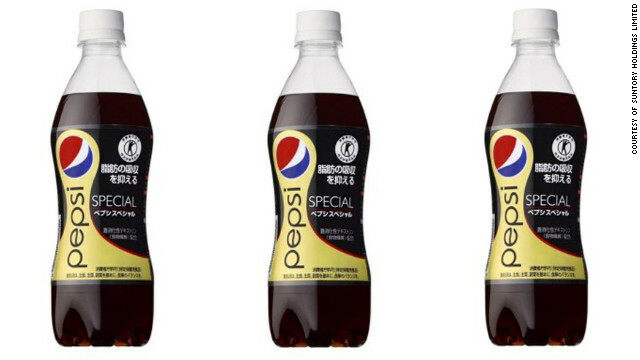 Pepsi Special, which is now sold only in Japan, contains the wheat-based product dextrin, a source of dietary fiber. This fiber’s supposedly weight-loss inducing properties allow the soda to be labeled “Food for Specialized Health Uses” in Japan. You know how… in the morning…you wake up, and you say, “Juice? Again?? If only I could just skip the next five hours til noon and have a soda.” Well, fret no more. Mountain Dew is now trying to break into the breakfast market with Kickstart, a Mountain Dew based drink combined with orange juice and caffeine. Good morning! Crystal Pepsi. Like Pepsi, but completely clear and, according to 90s marketing campaigns, “healthier.” I’m really interested in the idea of perception of a food – it’s color, appearance – either working with or against it’s taste and therefore successfulness. According to Moss’s article, adding too much of Dr. Pepper’s patented syrup makes the drink too dark and unappetizing to test drinkers. So apparently there is also a sort of “sweet spot” in terms of visual “consumption” of the drink? Not too light, and not too dark? As someone with celiac disease, I always take particular notice of gluten-free and celiac news when I find it. Recently, there have been a number of new articles about the world of the wheat-less. – Dunkin’ Donuts going gluten free?? It’s true. As someone raised in the spiritual home of Dunks, I’m excited to see that one of it’s testing grounds is in Boston. Each of the donuts and muffins seems to be individually wrapped (smart) and labelled “GF.” Although initially enchanted by the idea of strolling into a Dunkin’ Donuts and picking up coffee and a donut like a normal Bostonian, I’m curious about how they actually taste. I can’t tell you how many times I’ve discovered gluten-free products where I didn’t expect them and been really disappointed by their texture. Too many bakers/restauranteurs/etc. see the potential revenue in attracting gluten intolerant customers and aren’t too discerning in their recipes, resulting in an all-rice-flour, crumbly mess. – This well-written piece by Mother Jones does a great job of synthesizing recent studies and scholarship on whether the gluten-free diet is actually good for anyone who is not “officially” celiac or gluten intolerant. It also just does a nice job of explaining how celiac disease works beyond the “wheat=bad things” synopsis offered by some less detailed articles. – A New York Times article also discussing the rising prevalence of both celiac and non-celiac gluten intolerance, as well as why the rise is occurring (lack of “good” gut bacteria? higher gluten levels in wheat? who knows). – Another New York Times article discusses the potential link between gluten intolerance and other inflammatory diseases. Celiac is an inflammatory auto-immune disease and those who have it are more likely to have other inflammatory auto-immune diseases – lupus, diabetes, and arthritis, to name a few. The author of the article tells the story of how her son, suffering from a juvenile form of arthritis, experienced a dramatic improvement after going gluten- and dairy-free. – Unless you are gluten intolerant yourself, you’ve never had to read ingredient labels of strange things and learned even stranger. Like finding out that the new conditioner you were about to buy had wheat germ protein in it. Or that the main ingredient of Twizzlers is wheat. You might also not have known that Play-Doh is mainly composed of wheat, which means that young gluten-intolerant children can’t play with it. According to a recent Market Watch article,Play-Doh competitors are realizing the potential and creating wheat-free alternatives. So, sometimes I decide to teach full-time, apply to PhD programs, and train for a marathon, all at the same time. And, at those times, I forget to be a good blogger. Now, I’ve survived my first marathon, finished applying to graduate programs, and…well, I still teach. But that’s less of an excuse. As my first foray back into writing, I thought I should reflect on one of the more interesting food-related experiences I had over the holidays. On one of my weekends on duty at the school before our winter break, my teacher friend and I hosted a group of students to bake and decorate sugar cookies. You need to understand a bit more about my student demographic to know how momentous this was. Many, if not most, of my students are Chinese, and baking, indeed, even owning an oven, is not nearly as common in China as it is in the United States. Many had never made cookies before (although I use the term “made cookies” loosely. We used the sugar cookie dough from a tube). My students are a wonderful and powerful reminder of how our perceptions of food are colored by our cultural background. That weekend, it was not only close to Christmas, it was also one of our bakers’ birthday, so she had requested that we bake “the cake with the fun in it” for her. Funfetti cake, we assumed. After baking the cake and letting it cool on the counter, we gave the girls a simple buttercream frosting and some decorating icing. The girls proceeded to frost the top of the bottom layer and then place the other layer on top. “No!” they replied, shocked. “Then it would be too sweet,” replied the girls who had just consumed their weight in sugar cookies. A stranger looking cake I’ve never seen. But my students were thrilled with their baking success. 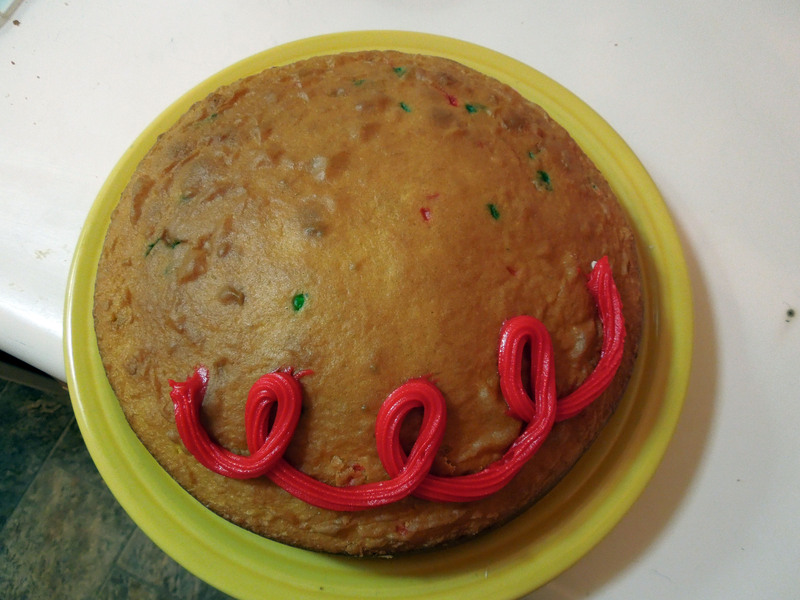 My friend and I clearly had a specific set of rules for how cakes should be put together and decorated, developed over years of American, middle-class birthday parties. Our students, clearly, did not. A valuable reminder for me that, despite the fact that this cake looks a little like the head of a Peanuts character, there is no “right” and “wrong” in food. “Starvation’s not an uncommon fate in District 12. Who hasn’t seen the victims? Older people who can’t work. Children from a family with too many to feed…Starvation is never the cause of death officially. It’s always the flu, or exposure, or pneumonia. But that fools no one.” These are the words of Katniss, the main character of Suzanne Collins’s immensely popular novel for teens, The Hunger Games, on her community’s constant struggle with hunger. Even if you have never read the books, it has been impossible to ignore the hype around the movie The Hunger Games, released today, March 23. Adapted from the first book of Collins’s trilogy, the film is already set for a successful opening weekend, with packs of young (and not so young) adults waiting for the record-breaking midnight showing on Thursday night. 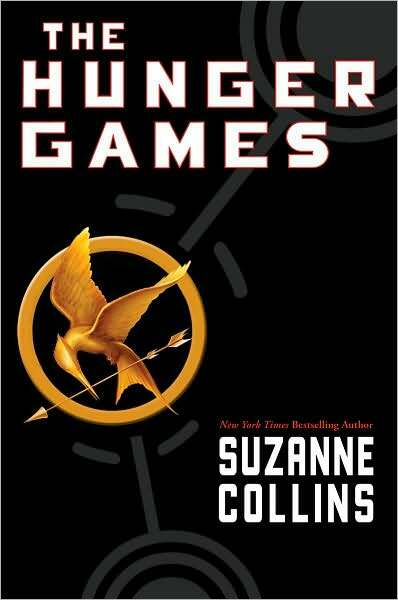 The Hunger Games and the two other books in the series are preoccupied with, as the name might suggest, hunger. Hunger dogs Katniss from her home district, where she illegally hunts for game to feed her family, to the Hunger Games themselves, where she must fight other teenagers to the death while trying to survive starvation and thirst. Katniss lives in a dystopian future version of North America in which the United States dissolved centuries ago to be replaced by a despotic Capitol ruling over thirteen subjugated districts. To ensure their cooperation, the Capitol requires two child “tributes” from each district every year to compete in the Hunger Games, a brutal challenge in which the winner is the sole remaining survivor. The books certainly have a clear point to make about food and hunger. Hunting, for example, is illegal, although the forest’s game could easily support Katniss’s district. Instead, she and all of the district’s residents are forced into debt by purchasing rations of grain from the Capitol. The inhabitants of the Capitol, on the other hand, binge and purge in order to indulge in their feasts to the fullest. The alimental divide between the haves and the have-nots in the world of the novel is sharp, unforgiving, and, in so many ways, not the stuff of fiction at all. Like the Harry Potter series before it, The Hunger Games series has gathered a passionate fanbase. And like Harry Potter, community organizers are attempting to harness the power of that fanbase to effect real change in the arena of global hunger. The Harry Potter Alliance, a fan activist group organized in the name of J. K. Rowling’s series, has begun a social campaign called Hunger is Not a Game in the hopes of educating fans of The Hunger Games series on the real problem of global hunger. The beauty of such campaigns, as one New York Times article writes, is that it offers kids and teens “the chance to be a hero like Harry,” providing the framework for their enthusiasm and passion to find an outlet in real-world problems. Hunger is Not a Game is working in conjunction with OXFAM and its GROW campaign to raise awareness of hunger in the United States and abroad and work toward the goals of OXFAM’s five-point plan. Using the movie’s launch on Friday as a focusing point, the campaign urged contributors to start food drives during the month of March and collect on the night of the premiere in movie theaters throughout the country. The Hunger Games movie itself has partnered with the World Food Programme and Feeding America, using the film’s plot and characters to both educate visitors to the website and call those visitors to action by asking for donations to both organizations. Dystopian fiction, a genre of which The Hunger Games is undeniably a part, is meant to force the reader to not only think about the future, but to think about the present. Even more importantly, the reader should take action within that present to prevent the dismal fictional future from coming to pass. Part of the excitement surrounding this film, for me, is that it is doing exactly what it is meant to do – both entertain and foster real social change. So how about you, have you read The Hunger Games series? Know someone who has? How else do you think the book could be used to engage the YA audience in issues of food and sustainability? 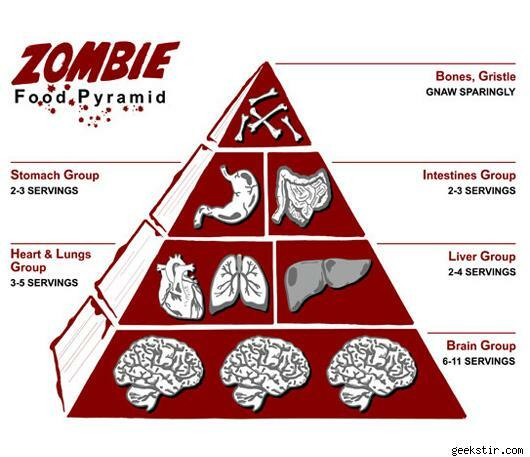 Slow Food or Slow Zombies? I’m always thrilled when the two great loves of my life, food and literary analysis, find each other in a piece of writing. This piece of writing found me, or was found for me, by my partner, who enables my weird scholarly interests. “Katja,” you say, “why are there zombies on your blog about food?” Blame Michael Newbury, of Middlebury College. Published this year in the journal American Literary History, Newbury’s article “Fast Zombie/Slow Zombie: Food Writing, Horror Movies, and Agribusiness Apocalypse” does much of what I aspire to do as a scholar. He places his interpretation of a series of contemporary zombie movies against the context of the modern scares in agribusiness to make a convincing argument, essentially about how pervasive our fears of Big Food really are. He notes that many zombie movies are placed against a backdrop of trash and junk food, showing the survivors eking out an existence on Cheez Doodles and candy. By constantly associating fast food with the zombie apocalypse, Newbury argues that these movies point out “the horror of modern eating.” He argues that, in that sense, the books of Michael Pollan, Marion Nestle, and others are just a watered-down, zombie-free version of the same critique offered by movies like 28 Days Later. And, just like Pollan, Nestle, etc., these movies offer a solution to the fast food crisis. Newbury argues that there are often attempts by the survivors at formal, candlelit dinners and vegetarianism in these movies: attempts at maintaining a more human/humane way of eating. However, unlike the work of food writers and activists, these horror movies don’t allow these humane acts of eating as a true, viable option by continuously interrupting them with zombie attacks. I don’t think the article is perfect — I’m not sure that Newbury has chosen to provide exactly the right sort of background on the food movement, for example — but I think that its the sort of analysis we do actually need more of (what? a practical use for English?) This is because he argues that the fear of agricultural apocalypse in zombie movies shows how widespread this fear is, and how pervasive it’s influence, i.e. not just in stories. I’d like to hear from zombie fans, though, and frankly, anyone else with their two cents. I, admittedly, don’t really care for all the face-ripping. For those of you who have a greater knowledge of the genre than I do — do Newbury’s ideas make sense? What do you think? I would love to post a link to the article, but unless you have access to literary databases, then I’m afraid we’re out of luck. Check it out! This past weekend saw the launch of a new site dedicated to the sustainable food movement, HandPicked Nation, featuring, in their words, “Real food. Real life. Served fresh daily.” The site’s founders are originally involved in film production, so the site features some great original videos and interviews, as well as some really great written content. I am in no way saying this because they’ve included one of my articles for the launch. Of course. The Huffington Post recently ran a piece called “Food TED Talks: The Eight Best Lectures on Eating and Food Policy.” For those who haven’t seen a TED Talk, essentially, they’re videos that run from 10-20 minutes long and they feature guest experts who speak on any number of thought-provoking issues. This Monday, January 23, is Chinese New Year, a genuinely Chinese holiday that has been celebrated for centuries. So what better time of year than this to look at genuinely not-Chinese Chinese food? One TED Talk from 2008 features New York Times journalist Jennifer 8 Lee (yes, her middle name really is “8”) talking about the ideas behind her book and blog, both called The Fortune Cookie Chronicles. Her writing and her talk explore what gets called “Chinese food” across the world. We’ve heard all this before, right? What we call “Chinese food” is totally unrecognizable to most Chinese people? But Lee discusses the idea in greater detail and with greater historical research than I’ve heard before. For example, in one part of the video, she talks about that staple of the Chinese restaurant, the fortune cookie. My favorite part is probably the clip she shows of her offering and explaining fortune cookies to people in China, who taste it with tentative curiosity and are surprised that there’s a “prize” inside. 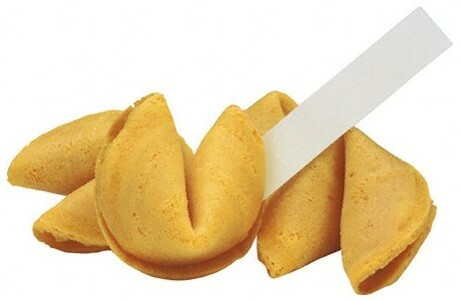 As it turns out, according to Lee’s research, the first fortune cookies are actually a Japanese invention and were imported to the US with Japanese restaurants, not Chinese. However, with the internment of so many Japanese inhabitants of the US during World War II, Chinese restauranteurs saw an opportunity to capitalize on a popular product. I won’t repeat the whole video, but it’s definitely worth a watch! 1. Growing up in Massachusetts, I have fond memories of the corn chowder at local restaurants, which was always creamy and filled with chunks of potato. 2. This recipe reminds me a lot of those corn chowders, but it also has bacon in it. 3. 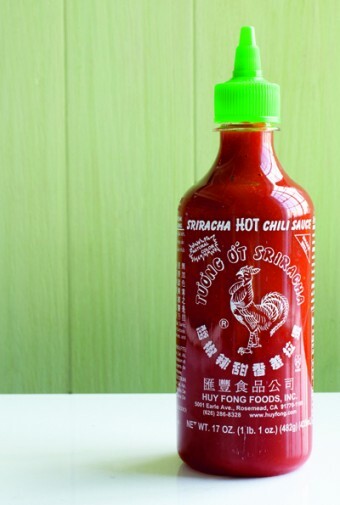 Not only does it have bacon in it, it also has sriracha, the rooster that makes everything taste better. Essentially, this recipe combines three different recipes — the one made by my mom and local restaurants throughout my childhood, which exists nowhere on paper and solely in my head as a Platonic idea of Chowder, this one, a fairly traditional recipe, and this one, which gave me the idea of adding sriracha to yet another unexpected dish. First, fry the bacon in a large saucepan until it’s properly brown and makes your kitchen smell wonderful. Take the bacon strips out and set them aside, and add the chopped onion to the hot saucepan with the bacon fat. Cook the onion until it begins to get translucent, and then add the diced potato. Give the potatoes a minute to start softening, then add the corn, vegetable stock, milk, heavy cream, bay leaf, and sriracha. Bring to a boil, then reduce to a simmer for 30 minutes. In the last five minutes, take out the bay leaf and crumble the bacon strips into the saucepan (adding it at the beginning will give you very soft, squishy bacon in your soup). Season with salt and pepper to taste, and ladle into bowls to serve. A spoonful of sour cream goes really well on top. 1. If you wanted a thicker, but less chunky soup, you could use an immersion blender. 2. This recipe calls for 1/2 cup of sriracha instead of the 1/4 I used. 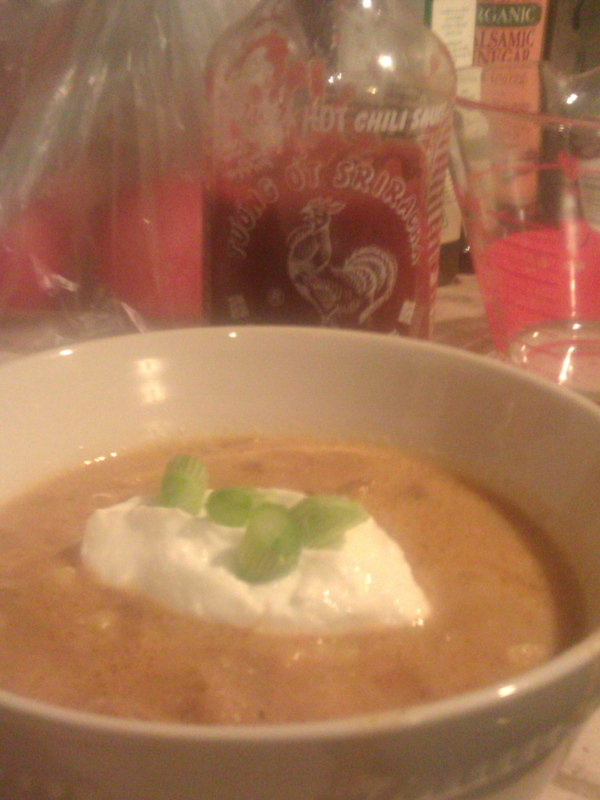 Now, I love sriracha, but I still wanted my chowder to taste like corn and not like fire. However, if you have hardier tastebuds than mine, go for the full 1/2. In a food processor, combine all ingredients and puree until very smooth. Add a bit of extra water if the mixture is too thick to blend. Makes about 2 cups. 2. 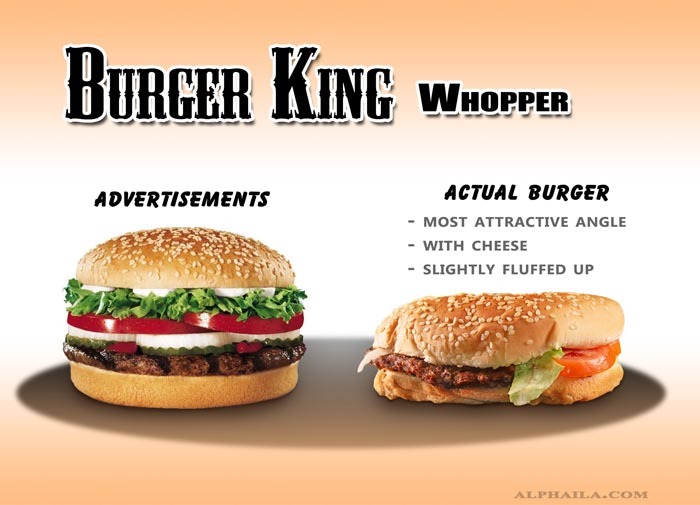 “Fast Food – Ads vs. Reality,” from the blog Alphailia. The author of this blog chose to compare the images of hamburgers and tacos from fast food advertisements (including McDonald’s, Taco Bell, Jack in the Box, and Burger King) to the real thing. This probably doesn’t come as a surprise, but the real food doesn’t quite stack up to the unearthly, perfect burgers in the ads. This is one of my favorites. Even at its most attractive angle, and “fluffed up” slightly to bring life to the bun, the real burger looks like the ad burger’s sad, special little cousin. 3. There’s been a bunch of food news recently about the growing number of people who are dumpster diving for at least some of their food. In doing research, I found out that there is a part of this movement that has a name — freeganism. A portmanteau of the words “free” and “vegan,” the term describes someone who “prefer[s] to repair and maintain the goods that already exist, share what is surplus, refuse to buy things [they] don’t really need, and acquire the few things [they] really do need through recovery of wasted goods and networks of mutual aid” (quoted from Freegan.info). Food from a dumpster (especially the dumpsters of supermarkets and other produce vendors) allows freegans and amateur dumpster divers to circumvent what they feel is an economy of excessive materialism and waste. The sputtering economy seems to have boosted the dumpster diving or “urban harvesting” phenomenon — or at least the media coverage it receives. Grist recently posted this article on the subject, and in 2011, the documentary Dive followed a group of freegans and their lifestyle choices. I think what interests me about this movement is it makes me wonder how well we’ve retained our ability, as a species of animal, to tell whether food has gone bad or not. I would think that, what with all the preservatives and funky things that end up in our food to prevent the natural process of decay, that we would be less able to tell the difference between “mmm, perfectly ripe” and “umm I don’t feel so good.” But apparently, according to a lot of accounts that I’ve read, getting sick from dumpster food isn’t common among the initiated. To celebrate the holidays and thank some of the special people in my life, I made my own candy for the first time. I’m not filing this under “Cooking for the Fearful” because, frankly, I was a little fearful going into this. Making candy has always struck me as too precise and precarious an enterprise for my less-than-exact ways in the kitchen. However, the bark recipe in particular is pretty foolproof, and mouse assembly is a breeze. In a small saucepan, combine milk and butter. Cook and stir over low heat until the butter is melted. Place the confectioners’ sugar in a large bowl. Add milk mixture; beat until smooth. Add the coconut and orange extract; mix well. Roll into 1-in. balls; place on waxed paper-lined baking sheets. Refrigerate until firm, about 1 hour. In a microwave, melt the chips, chocolate and shortening; stir until smooth. Dip balls into chocolate; allow excess to drip off. Place on waxed paper; let stand until set. Yield: 9 dozen. Place the chocolate chips in a microwave-safe bowl and heat them until smooth, working in 15-second intervals, stirring between each. Holding a cherry by its stem, dip it into the chocolate and swirl it around to completely cover the fruit. Set it on its side on the waxed paper and immediately press a Hershey’s Kiss onto the cherry for the head. For the ears, gently wedge two almond slices between the Kiss and the cherry. Repeat to make 24 mice. Melt the white chocolate, either in the microwave or in a double boiler. Once the chocolate is melted, spread it over the aluminum foil until it’s about 1/4 inch thick. Sprinkle chopped up mango and ground fresh cardamom all over the chocolate. Let the chocolate cool, either at room temperature or in the refrigerator. Once cool, break the chocolate apart into big chunks.